Chiang Rai – Thai and Myanmar authorities on Saturday built a 17-kilometer long barrier in the northern province of Chiang Rai as a precautionary measure against forest fires. 1,500 people gathered in Mae Sai district to take part in the Thailand-Myanmar fire prevention program where participants erected fire barriers from Ban Ja Lor Community to Baan Huay Nam Rin Community in Wiang Phang Kham subdistrict. 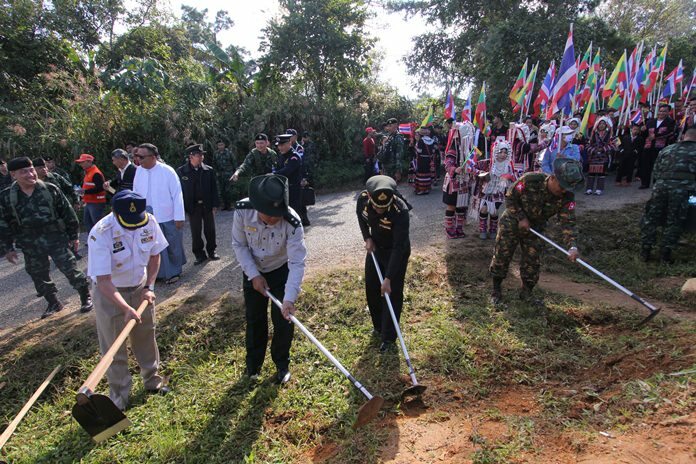 The activity was held in honor of HM King Maha Vajiralongkorn as well as to strengthen relations between the two neighboring nations. Forest fires have become more common and frequent in recent years given climate fluctuations and global warming, causing damage to properties and health concerns among northern residents. Thai authorities said they would continue to educate the public about fire safety and encourage them to join forces with related agencies to prevent forest fires and hazardous smoke.